Now, I want to preface this review by stating nice and clearly that I haven't watched the film adaptation of this book, and so cannot compare it in any way. I actually have waited to review this book because I thought I might have got the film through LOVEFiLM by now (awesome service by the way, if you haven't tried it before you really should) and I really wanted to see which was best, as I am a fan of seeing adaptations, however I haven't, so I thought I would just get on with talking about the book. 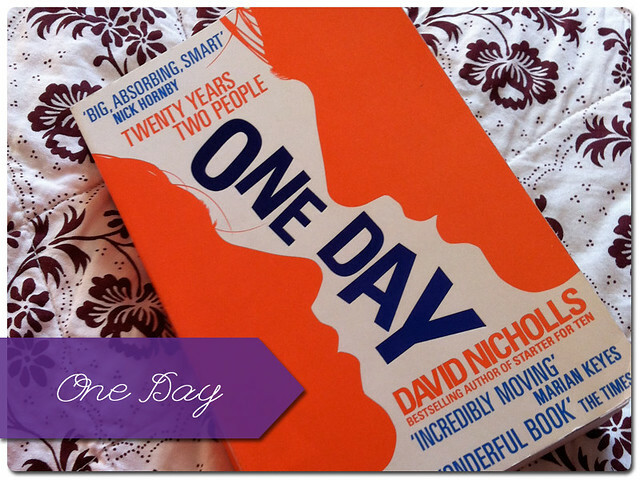 One Day has gained some acclaim since its 2009 publication, winning the Galaxy Book Award in 2010 and as I mentioned there recently has been a film featuring Anne Hathaway (also featuring a terrible Leeds accent, apparently), which the author, David Nicholls, adapted himself. I knew of Nicholls before I read One Day, in fact another of his novels, Starter for Ten (also adapted for film), was sitting on my shelf long before this one and will no doubt feature in a review post soon. I have always had the impression that he would be able to successfully write the 'student' character, and how that character changes, and One Day definitely didn't disappoint in that regard. I have to admit I have no idea why I thought this, in fact I am a bit confused about how I feel about the book in general, but I just had a feeling that he would do so successfully. The story follows two characters, Dexter and Emma, shortly after their graduation from university, through twenty years of life and their somewhat strained friendship. The twist is obviously that the story only details one day for each of those twenty years, St. Swithin's Day, July 15th. Now I have to admit that this fun way of telling the story is the reason I was so attracted to the book. I am a big fan of telling a story in a non-traditional manner, and this works perfectly for this particular story. The characters are typically normal, and as such lead relatively normal lives. They each experience a modicum of fame for a while, but essentially their lives are pretty standard and they endure hardships that a large portion of the readership could relate to and because of this only showing one day of their lives each year works nicely, if Nicholls were to write a great tome where he went into each week of life for each of those years you would be bored silly! In essence the technique manages to produce a fabulous portrayal of real life, expectations squashed and potential missed as well as the little things that can make one individual day perfect. Now I am loathe to go into much detail about the story itself, because it would require a HUGE spoiler warning, but if you would like to discuss it further you are welcome to send me a message, because that big spoiler is the reason I am not really sure how to feel about the book. It shocked me! Not many books manage to shock me this much, even less so make me cry while shocked. I think Nicholls very cleverly used his writing technique to lull the reader into a sense of security, and I will say no more because I really don't want to spoil it for anyone who hasn't read, but the end of the book left me with that sort of melancholy empty feeling, as if the unease of the characters within the last few chapters of the book stayed with me after reading. Even now, about a month since I finished the book and wrote my initial notes for this review when I think of it or look back through the notes that feeling of unease comes back. That, ladies and gentlemen, is true writing skill, and why I have given it five stars.